June 1 is a significant day in meteorology both locally and across the Western Hemisphere. It was 7 years ago today a devastating severe weather outbreak began in the morning hours in Central/Eastern MA/Northern RI and was capped by a high end EF-3 tornado that tore through Springfield and into Southwestern Worcester County. I graduated from college just days prior with no job prospects in the field of meteorology (at the time I blamed the job market- in hindsight I should have done more with the opportunities that were available to me in college). June 1, 2011 inspired me to start a blog which I did a week later right here at this exact address newenglandwx.blogspot.com. I wasn't "in the field", but I was still actively practicing the science of meteorology. I was looking to justify the money my parents and I spent on my education and this filled that role for me. I blogged off and on for 6 years covering events such as Hurricane Irene, the 2011 Halloween Snowstorm, Hurricane Sandy, the Blizzard of 2013, the Blizzard of 2015 (and that entire crazy winter), as well as the 2016 drought and countless other smaller weather events. It led to a short lived role as a national blogger for a storm chasing company called Tornado Titans. By June 2017 page clicks were up and I decided to get bold and pull the trigger on something I have always wanted to try; my own meteorology website. I purchased a domain name and attempted to sell premium weather content. I moved the platform to WordPress and established Blackstone Valley Weather Service. Page views quickly plummeted as I put content behind a paywall. And I get it. Why pay for weather when there are so many places to get it for free? Eventually I dropped the paywall and the page views returned in force this winter. But I wasn't going to keep the blackstonevalleyweatherservice.com domain. I spent a lot of money trying to get the new page started but with no money coming back to me it is not sustainable. On top of that I took a new job as a consultant in the environmental/engineering/atmospheric science world so I have event less time than I did before to commit to growing revenue. The domain name is also too long. Next time I launch a new site, and there will be a next time, the name will be short and to the point. I learned a lot trying and ultimately, for now, failing to start a business. The "business" side failed but the blog grew. Facebook likes are approaching 800 people and page views in March were AWESOME. So what is next? For now I will return to my roots right here on Blogger. I have missed blogging. There is something that is therapeutic about talking about the weather. As I look back at some of my past work, I'm proud of the effort I put in and look forward to delivering more quality work to my readers in the future. Today is not only the anniversary of the 2011 New England Tornado outbreak but also marks the beginning of the North Atlantic Hurricane Season. Although slightly odd for a New England meteorologist, I've always been enthralled by Hurricanes. Today just feels like the right time to start blogging again. Sara replaces Sandy on this list. Sandy is just the 4th name from the original 1982 list to replaced. Gordon replaced Gilbert and Joyce replaced Joan after the 1988 season. Kirk replaced Keith after the 2000 season. In comparison, the 2023 list is full of retirements. Being the list for the deadly 2005 and 2017 have allowed for this list to stray far from the original in 1981. Past performance of the list has nothing to do with the upcoming season of course. There is hope for a quiet season thanks to cooler than normal sea surface temperatures in the Main Development Region of the tropical Atlantic. If this persists, it would help to limit tropical development between the Western African coast and the Caribbean islands. After Irma and Maria, I certainly hope this is true. For comparison here is 6/1/17. Notice the abundance of warmer than normal water between the islands and Africa. 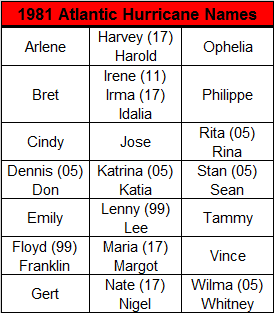 Most forecasts are calling for an average season with 10-14 named storms, 5-8 hurricanes, and 1-3 major hurricanes. 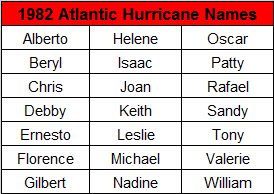 We've already had one named storm, Alberto. Alberto tracked northward from the Western Caribbean Sea into the Gulf of Mexico before making landfall along the Northern Gulf Coast on Monday. The storm tracked into the Great Lakes. The remnant energy is in Eastern Canada and is indirectly responsible for the humid weather today and tomorrow. A few showers will be possible this afternoon with dew points in the low 70's. Saturday will be similar but a cold front will drop south late tomorrow afternoon/early evening. Tomorrow is not a washout and should be dry for the majority of the afternoon. Temperatures cool down on Sunday as the pattern changes to a cooler and potentially wetter regime. Thanks for reading and welcome back.